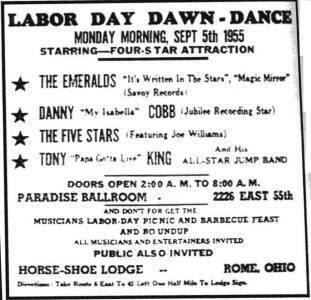 Cleveland was one of the hotbeds of midwestern R&B activity in the 50s. 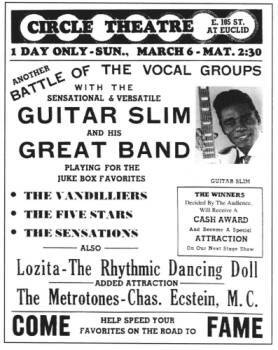 Groups like the Hornets, the Coronets, the Metrotones, the El Pollos, the Spartans, and Edwin Starr's Futuretones (back when he was still known as Charles Hatcher) performed at the city's many clubs. And so did the 5 Stars, later to be known as the Hepsters. 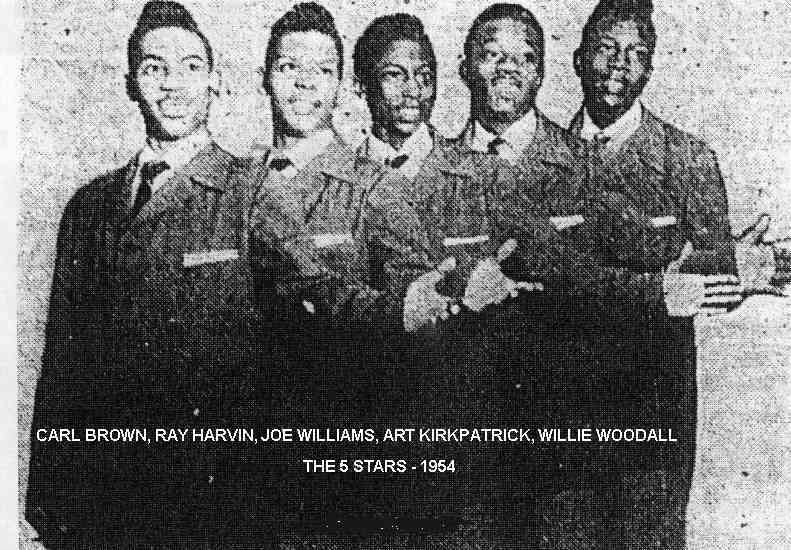 The 5 Stars started out around 1953, as schoolkids who knew each other, mostly from the neighborhood of Central Cleveland. They were: Joe Williams (lead and piano), Raymond Harvin (first tenor), Harvey Tyler, (second tenor), Willie "Woody" Woodall (baritone), and Art Kirkpatrick (bass). They didn't all go to the same high school: Joe and Harvey went to East Tech; Woody, Art and Ray were at Thomas Edison. Influenced by the 5 Keys and the Moonglows, they practiced at the Friendly Inn Settlement House and then started singing around at house parties (lots of house parties) and in the club scene. 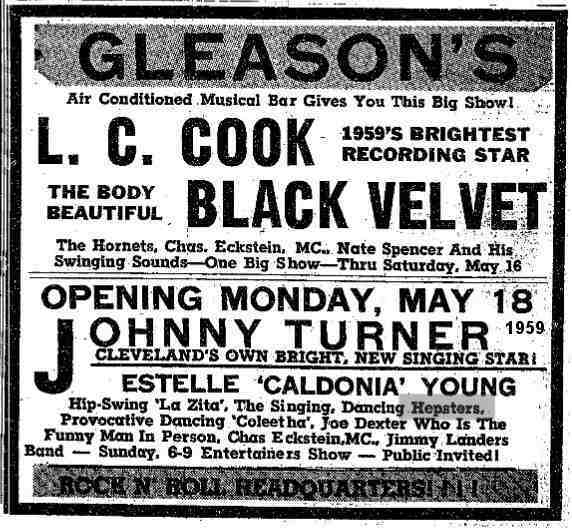 Sooner or later they would appear at most of the hot spots in Cleveland: Gleason's Musical Bar, the Circle Theater, the Chatterbox Musical Bar, Club Trinidad, Club Congo, Jack's Musical Bar, the Ebony Lounge, and the Rose Room of the Hotel Majestic. Their repertoire consisted of songs by their idols as well as their arrangements of the hits of the day and a few original tunes. By 1954, they were having problems with Harvey Tyler. As fate would have it, Carl Brown, who was a member of another local group, was walking down the street singing "Golden Teardrops" to himself. The rest of the 5 Stars heard him and he became the group's new second tenor. By this time, they'd taken to practicing at Joe Williams' house (the one with the piano). 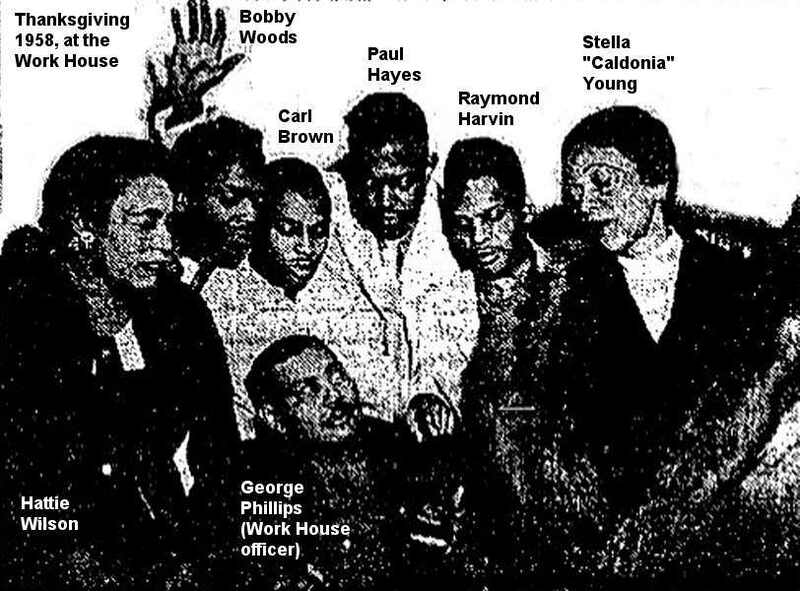 At a show, probably in 1954, they found themselves on the same bill as Stella "Caldonia" Young, an "exotic dancer." She was putting together the Caldonia Young Revue, and offered to manage the 5 Stars. 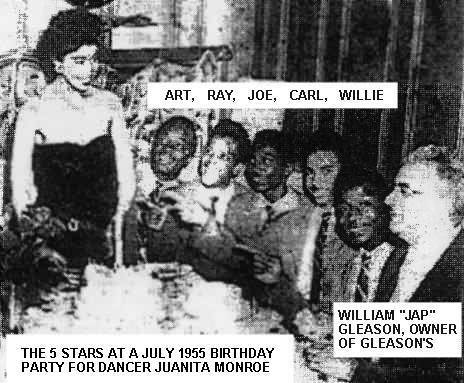 They appeared at the Teen-Age Night Club sometime in December 1954. This blurb in the December 1, 1954 Cleveland Call And Post should bring back some memories: "The Teen-age Night club, sponsored by the Spanish Ladies of the Phillis Wheatley Association, was highlighted by the beautiful decorated gymnasium. Featured were balloons and soft lights. Ginger ale and fruit punch were served." Actually, I can't figure out from that blurb where (or even exactly when) this function took place. Since they mentioned a gymnasium, I assume it was at some school. A small blurb about them in the December 4, 1954 Cleveland Call And Post talked about the 5 Stars. 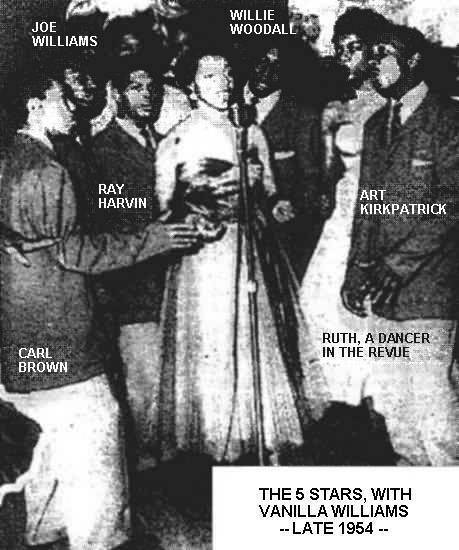 It said: "A new John Hay singing group is the Five Stars, composed of Carl Brown, Joe Williams, Art Kirkpatrick, Willie Woodall and Raymond Harden [sic]. They appeared at the Rose Room, Hotel Majestic recently." While none of the original members attended John Hay High School, Carl Brown did, so I guess that was an extrapolation. Woody and Art were replaced by baritone Bobby Woods and bass Paul Hayes. They heard Paul singing with another group and were impressed by his bass voice. They immediately enticed him away ("we had work," says Carl). It was pretty much the same story with Bobby: Ray remembers that they stole him from a group they heard singing at the Majestic Hotel. 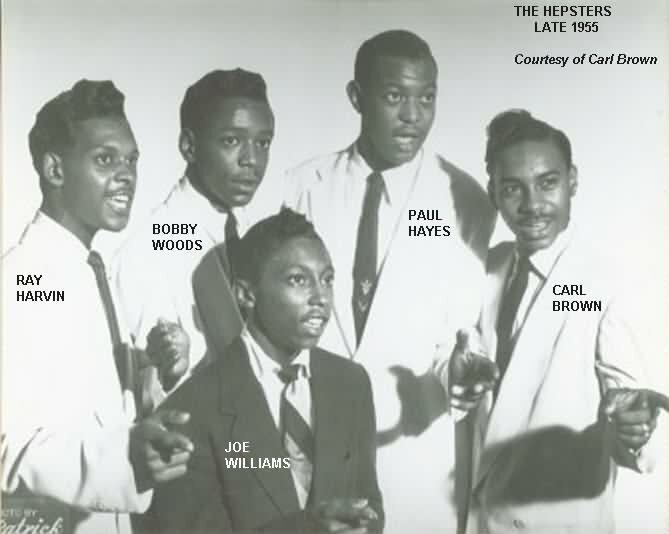 Since Clark wrote for Hep Magazine, he decided that it would be cool to rename the group the "Five Hepsters" (subsequently shortened to simply the "Hepsters"), and that's who they were for the rest of their career. 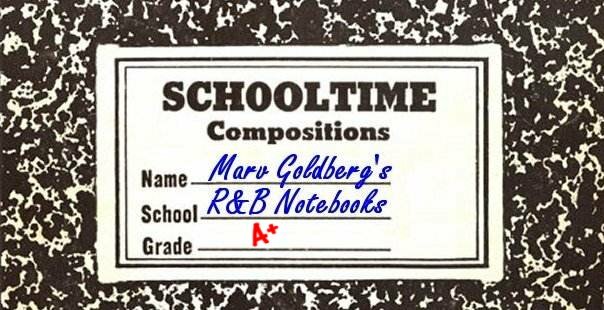 They drove up on a Thursday, spent Friday doing the recordings, and returned home on Saturday (remember, they were all still in high school at the time). All four songs were recorded at the same session (in spite of what the master numbers tell us). "Rockin' N' Rollin' With Santa Claus" featured Joe and Carl in a duet lead; the others were fronted by Joe alone. For whatever reason, Ronel decided to drop the "Five" from the group's name. 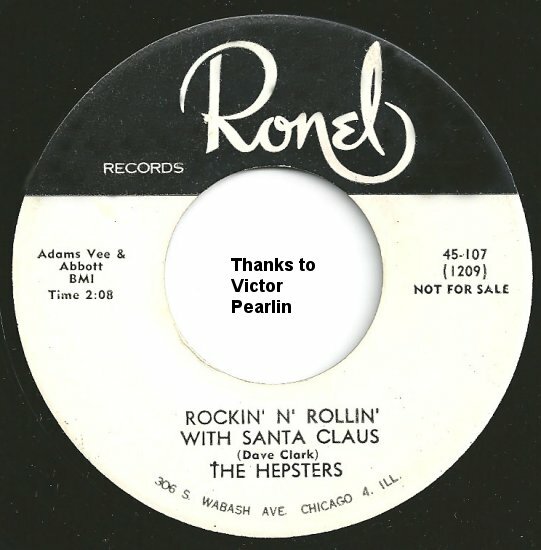 The first two sides ("Rockin' N' Rollin' With Santa Claus"/"I Have To Let You Go") were issued in November 1955, just in time for the Christmas season. (Santa brought an early lump of coal when the song was mis-labeled "I Had To Let You Go.") Ray says he remembers hearing them played on local stations. Carl heard them on Jockey John [Slade]'s show on WJMO; "Rockin' N' Rollin' With Santa Claus" ended up in WJMO's Top Ten. The record was reviewed on November 19 (both sides rated "good"). Other reviews that week went to the Midnighters' "Rock And Roll Wedding," the Hearts' "Until The Real Thing Comes Along," Nappy Brown's "Doodle I Love You," the Sunbeams' "Come Back Baby," Jimmy Jones & the Sparks of Rhythm's "Stars Are In The Sky," the Cadets' "If It Is Wrong," the Saigons' "You're Heavenly," Marvin & Johnny's "Will You Love Me," Marvin & the Chirps' "Sixteen Tons," the Coronets' "Don't Deprive Me," and the Squires' "Heavenly Angel." 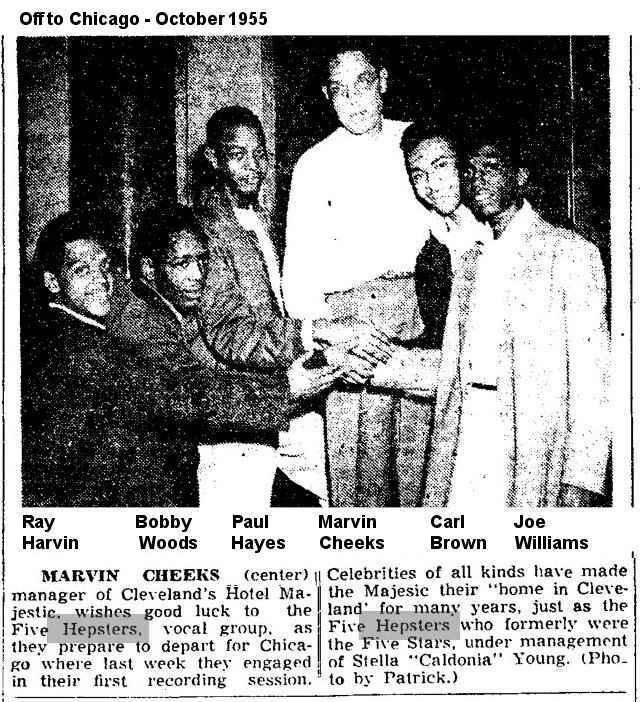 The December 3, 1955 Cleveland Call And Post had a little blurb in the "With Teen Clubs" column, seemingly for no particular reason: "Five boys formed a group and they have thus made a name for themselves. They are Carl Brown, a Hayite [that is, from John Hay High School], Bobby Woods, Paul Hayes, Raymond Harvin and their lead of the new hit 'I Had To Let You Go', Joe Williams. The boys are recording for Ronel Records. They have appeared at most of the exclusive nightclubs in Cleveland. 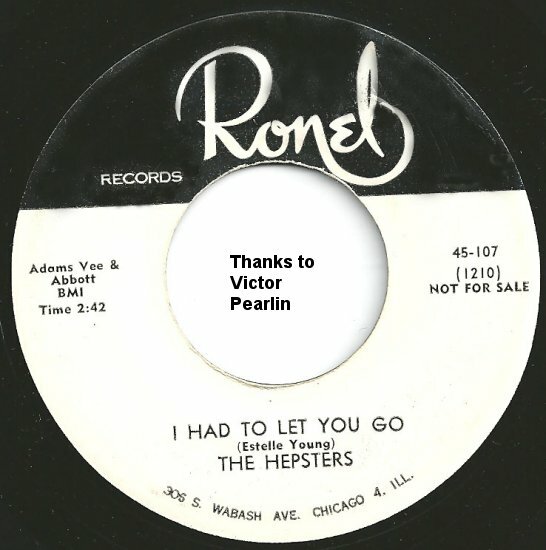 The Five Hepsters are under the management of a well known dancer, Estella Young." 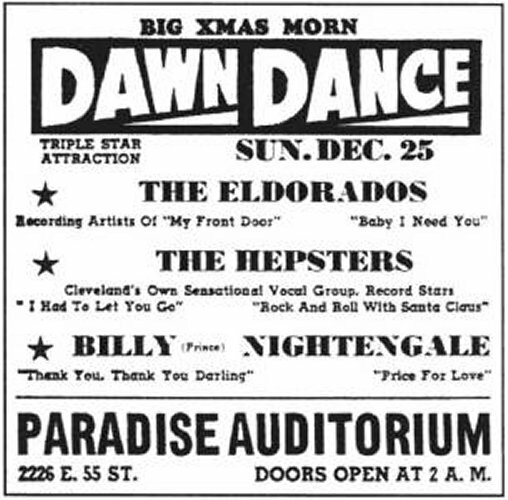 On December 25, the Hepsters appeared at a Christmas morning Dawn Dance at the Paradise Auditorium, along with the El Dorados. The afternoon of December 31, they appeared at the Rose Room of the Majestic Hotel as part of a show given, for its employees, by the Cleveland Call And Post. That night, they were back at the Paradise for the New Year's Eve show, which ran from 10 PM through 8 AM. 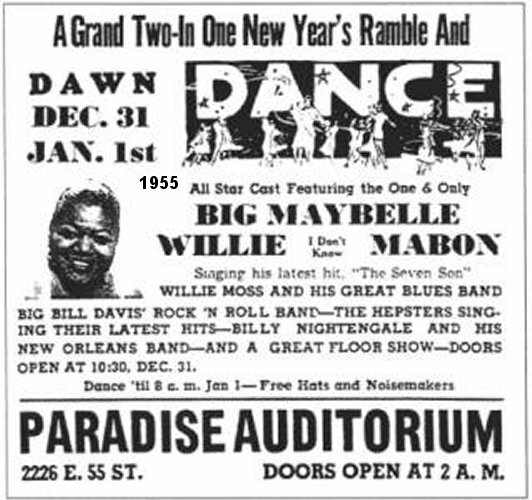 This time they shared the stage with Big Maybelle and Willie Mabon. The February 4 Cleveland Call And Post had an article about them titled "Teen-Age Quint Now Are Recording And TV Stars". The article was a mess. Under a photo correctly showing (but not identifying) Ray Harvin, Bobby Woods, Joe Williams, Paul Hayes, and Carl Brown, it confidently named the members as Joe Williams, Raymond Harvin, Carl Brown, and the long-gone Art Kirkpatrick and Woody Woodall. In early 1956, at a point when, as Carl says, "we were starting to get pretty good," Caldonia told them that there really wasn't anything more she could do for them. She wanted to find them a better manager, but insisted that she continue to receive 10% of their earnings. They thought about it and told her "no" in no uncertain terms. She got mad and told them they were on their own from then on. At this point, Carl took over their booking duties. 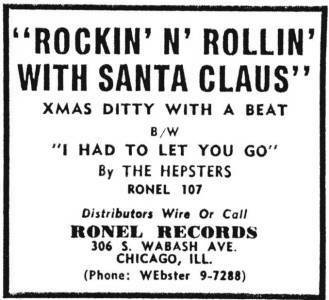 Nothing much happened with "Rockin' N' Rollin' With Santa Claus" outside of Cleveland, and Ronel sat on the other two masters for quite a while. 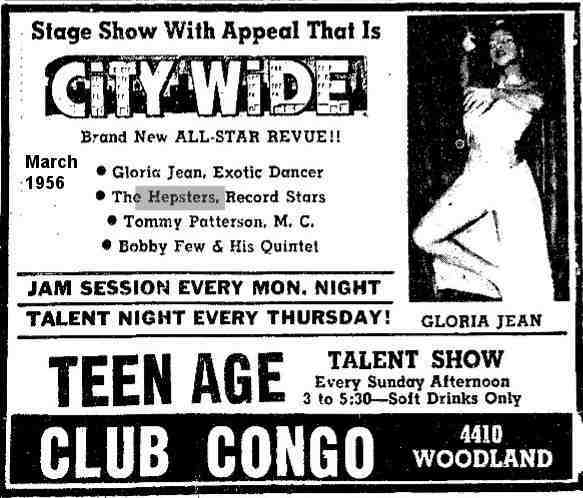 In March 1956, the Hepsters appeared at Cleveland's Club Congo. By June, the Hepsters had all graduated from high school, but life hadn't yet started getting in the way. All of the guys lived at home so, as Carl says, "We didn't need much money." Thus, they all continued to sing on a full-time basis. 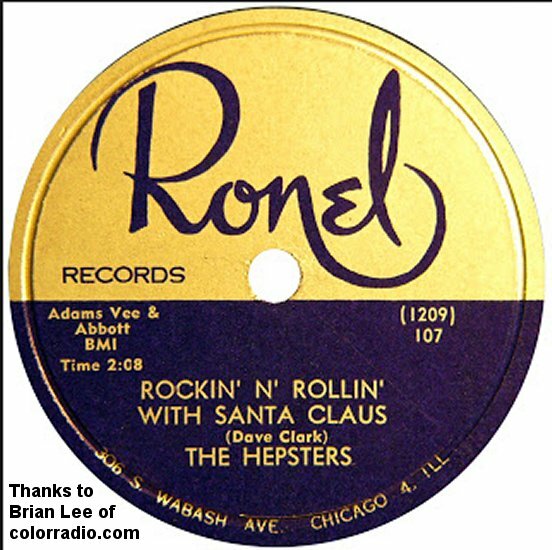 It took Ronel a full year to release the other two Hepsters masters. "I Gotta Sing The Blues"/"This-A-Way" didn't appear until December 1956. The holdup was due to their break with Caldonia. She told them that "If you leave me, your next record won't come out." Brave words, but Ronel eventually decided that they needed to at least try to make some bucks off it. The disc was reviewed on December 29 (both sides "fair"), along with Joe Turner's "Midnight Special Train," the Teardrops' "I Prayed For Love," the Orioles' "For All We Know," the Ravens' "Water Boy," and the Ramblers' "The Heaven And Earth." Carl can't remember hearing either side in Cleveland, but his mother lived in Chicago, and she told him she'd heard it there. Sometime in 1957, three guys from Birmingham, Alabama came through town, on their way to anywhere that they could become big-time singers: Eddie Kendricks, Paul Williams, and Kel Osbourne. They ended up working as busboys in the Majestic Hotel, at which the Hepsters appeared frequently (the Rose Room). Of course, Caldonia got involved with them and ended up driving them to Detroit, where they formed a trio called the Primes. Caldonia offered to take Carl Brown, but he turned her down, possibly not a great move in light of subsequent events. The Primes quickly attracted attention, even getting a female "sister" group called the Primettes (you may have heard of them in their 60s incarnation: Diana Ross and the Supremes). By 1961, Kendricks and Williams had joined with the remnants of a group called the Distants to become the Temptations. They did well, as I remember. 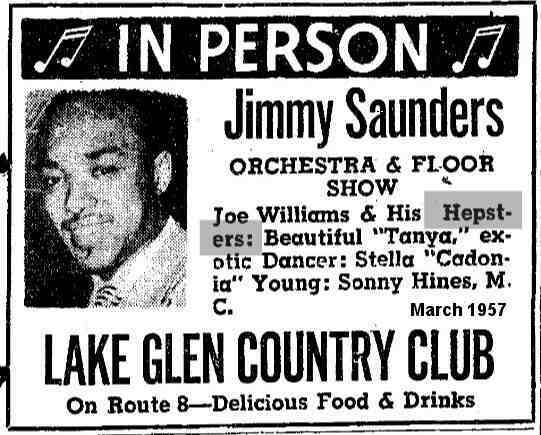 In early March 1957, Joe Williams and His Hepsters appeared at the Lake Glen Country Club. They must have done well, since they were invited back in April. On both occasions, Caldonia appeared on the same show. (It's possible that she was managing them once again.) 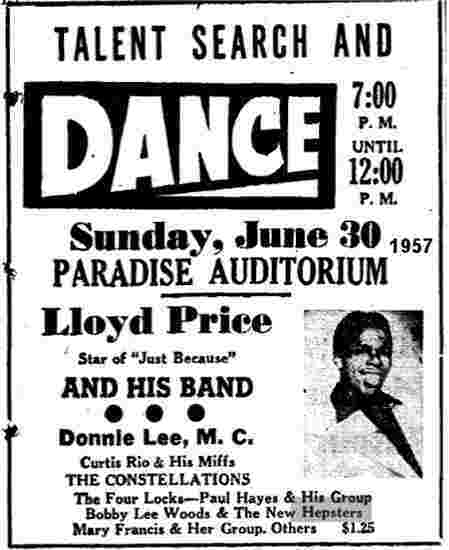 On June 30, they were part of a show at the Paradise Auditorium that starred Lloyd Price. 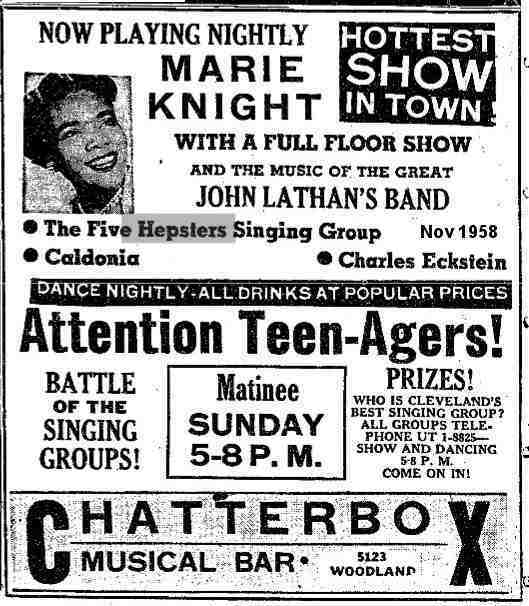 There's nothing more about the Hepsters until November 1958, when they appeared at the Chatterbox Musical Bar along with Marie Knight and, once again, Caldonia. They also did a performance for the prisoners at the Warresnville Work House. 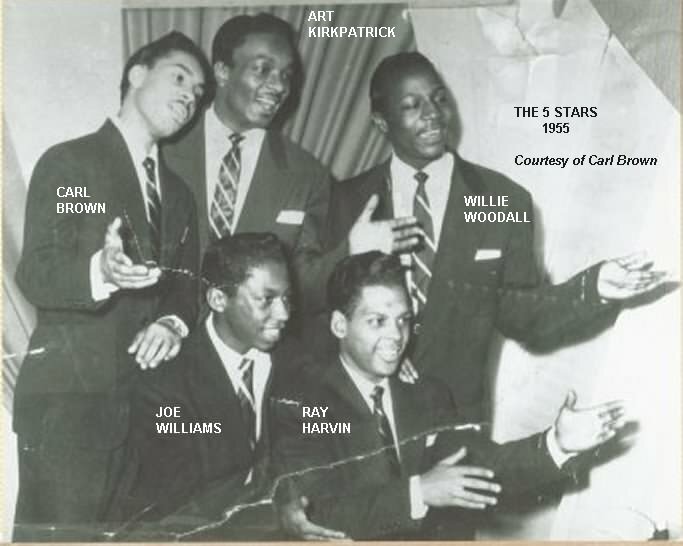 A photo showed Bobby, Carl, Paul, and Raymond, but not Joe Williams. By 1958, Carl Brown was getting "tired of trying to make it work." He just announced one day that he was going to give it one more month and then get a job and a car. In 1961, he joined the Navy and spent the rest of the decade in several small vocal/instrumental groups that operated out of Naval Air Stations that he was based at. I don't know who replaced him in the group. And that was it. 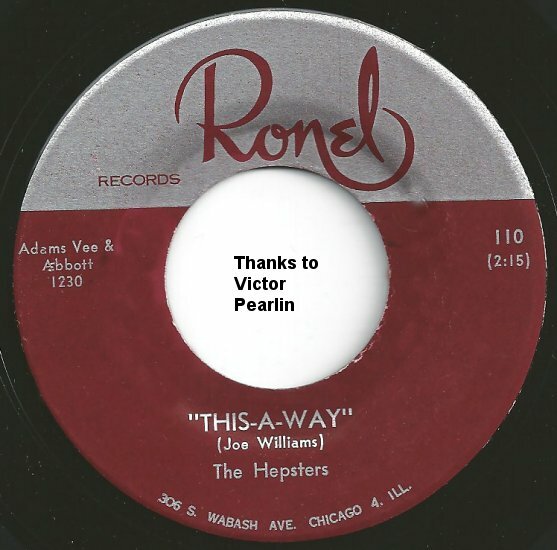 The Hepsters were another of the myriad R&B groups that existed in the 50s. Most came and went without a trace. 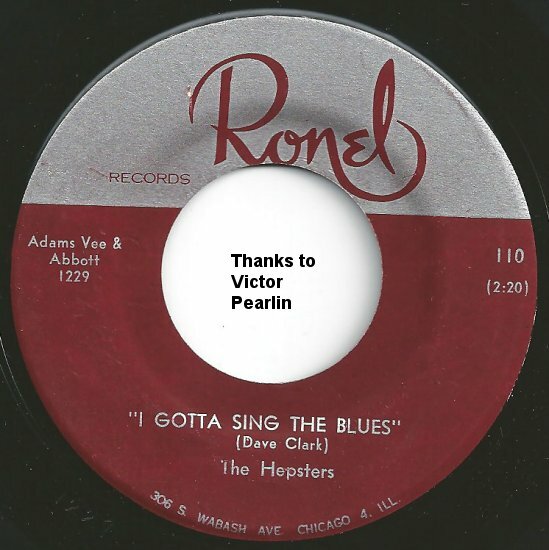 At least, with the Hepsters, we have a couple of fine recordings to remember them by. Special thanks to Galen Gart; most of the illustrations and photos were taken from his First Pressings series and from his Rhythm & Blues In Cleveland book. (There are some pretty horrible photos here, but they came from poor quality microfilm; we probably can't do better.) Discography by Ferdie Gonzalez.